Why Can't I Manifest What I Want? The Law of Attraction is all about vibration. Everything is vibrational; your thoughts, your ideas, every being. You will draw to you whatever vibration matches yours, wanted or unwanted. You're always free to change your mind and choose a different future, or a different past. You must be what it is that you’re seeking, you need to put forth what you want to attract. You wouldn't have been given your desires in the first place if you didn't have the capability of achieving them. You attract what you think you deserve. There’s more to the process of manifesting than most people realize. The source of your destiny goes much deeper than just your thoughts. Other important factors, like natural cycles, shared consciousness, karma, environment, and your soul’s intention, will influence what you draw to your life. Do you want to publicize your affirmation and have followers that support your intention? Go to http://intent.com/ to join the Intent network. There is a saying that goes like this “Keep on passing the open windows.” It means, don’t jump out and fall to your death. Stay alive to finish your plans and fulfill your dreams. 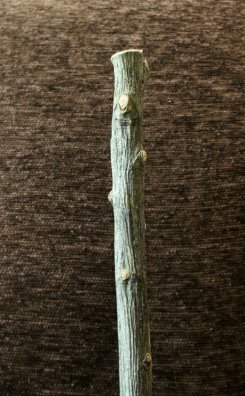 While working on a spirit stick I noticed all the nubs on the wood that were potential branches that never matured. I saw this as a metaphor for some of the dreams we have that don’t get manifested or some of the forks in the road we could have taken but didn’t. The nubs could also be a metaphor for the exit points that exist in our lives. Before we incarnate we set up a series of exit points where we can opt out (i.e. return to the spirit world) if we want. We always have free choice so we can go or stay depending on what we decide at that point in time. So, do you ever wonder about those “near misses”? They might have been an exit point you passed up. And if you did pass it up, it means you have more work to do on the planet in this lifetime. So contemplate making the most of what time you have. You never know when you will meet the next exit point. Am I clearing karma from past actions that are blocking this manifestation? Did I create a contract in a past life that is blocking this manifestation? Did I create a pre-life selection vision that doesn’t include this manifestation? If I manifested this would it serve my highest good? If I manifested this would it be in alignment with this life’s purpose and with my soul’s overall purpose? There are many paths to finding answers to these questions, such as shamanic journeying, meditation, and even experiencing a near death experience, as Anita Moorjani did in her book Dying to be Me. Meet and converse with your Higher Self. Meet and converse with your Future Self. Discover and clear any self-sabotage sub-personalities. Experience Past Life Regression to identify and clear overt karmic acts, modify past contracts with yourself or significant others, and tap into a past talent to bring it forward to this lifetime. Experience Life between Lives regression to discover your pre-life selection information, this life’s purpose, and your overall soul’s purpose. The most important takeaway is that we shouldn't blame ourselves for not creating something that we want. Everything that happens to us does so in the perfect time and place and for a specific purpose. The karmic LAW OF CREATION states: You attract what you are, not what you want. So clear your karma, do your personal work, AND follow the rules of manifesting and you will create what you want. The LAW OF CAUSE AND EFFECT: As you sow, so shall you reap. The LAW OF HUMILITY: What you resist, persists. There are two Laws of the Universe that seemingly contradict one another. They are “opposites attract” and “like attracts like”. So which one is true or are they both true? The Law of Attraction is used when discussing the nature of bodies that have a tendency to attract contradicting itself as a physics law which serves to define specific properties. Let’s look at the law of “opposites attract” first. This is called the LAW OF NEGATIVE ATTRACTION which states: Like attracts unlike. Energy and actions often attract their complimentary opposites. Opposite attraction is a law of physics called Coulomb's Law, which states that like charges repel and opposite charges attract. It describes the electrostatic interaction between electrically charged particles and is the foundation of the theory of electromagnetism. Everything is made up of atoms, which have a positive or negative charge. Positive atoms repel each other and negative charges repel each other, but a positive and a negative charge are attracted to one another. Magnets are the same. North repels north, south repels south, but north and south attract each other. After the discovery of sub-atomic particles, however, new laws of quantum physics had to be created. For one, scientists found that atoms colonize because of their similarity. That which has similarity is compatible with that of like nature. A resulting law is now the LAW OF POSITIVE ATTRACTION which states: That which is sent, returns. To create a particular reality you must put out energy of a similar sort. This law as applied to the metaphysical theory of manifestation is known as the LAW OF ATTRACTION which states: where your attention goes, your energy flows. In other words you attract what you are and that which you concentrate upon. On a physical level opposites attract because the belief is that we are all separate. But on a metaphysical level, we now know that we are all connected so the new belief is like attracts like. 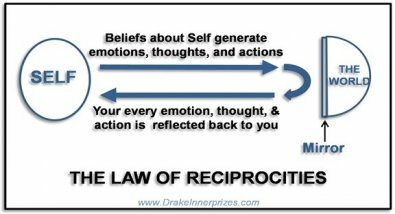 I propose we reinforce the Law of Attraction with the LAW OF RECIPROCITY. It states: All our beliefs about Self generate emotions, thoughts, and actions that are projected on to the world. The world is a mirror which reflects those emotions, thoughts, and actions right back at us. So discover your wisdom and that changes your vision. What Does "Opposite" Really Mean? So how does one reconcile the law of opposite attraction with the law of like attracts like? Perhaps one way is to change one's perspective on what "opposite" really means. For instance, do opposites really attract in relationships? What really happens when two people meet is that each one “projects” on to the other, what s/he wants the other person to be. It is very complex and based on a number of concepts such as: What do we want that person to reflect to us? Are they giving us lessons we need to work on? What is our contract or karma with this person? The false belief is that they are “opposite” of us but in truth they are reflecting back to us the hidden part of our own self. The LAW OF POLARITY states: 1. Any pattern of data can be split into at least two patterns with opposing characteristics and each will contain the essence of the other within itself. 2. Everything is dual; everthing has poles; everything has its pair of opposites and one of the active forces of the universe is the attraction and repulsion between sets of poles. The ancillary LAW OF OPPOSITES supports the Law of Polarity. It states: everything has a reverse relationship. Anything can be split into two complete reverse characteristics and each of these reverse characteristics contains the essence of the other. Each end of polarity contains the potentiality of the elements of the other. The Rosicrucian LAW OF DUALITY is yet another reinforcement of the polarity laws. It states: all living situations contain both positive elements and negative elements. It is duality which gives life to a situation. The LAW OF DYNAMIC BALANCE states: Dance to the music. To survive and become powerful, one must keep everty aspect of one's universe in a state of dynamic balance with every other one; extremism is dangerous on all levels of reality. LAW OF CAUSE AND EFFECT Every cause has its effect; every effect has its cause. Every action has an equal and opposite reaction. LAW OF CENTER Everything has a center from which it obtains its source of energy, intelligence, and pattern which is continually self-renewing. Each center in minutely connected to every other center and to the one Center from which all life is vitalized. LAW OF FREE WILL The law of free will operates in 3 ways. 1. You always have free will in how you respond to any situation. 2. Although many of the major events in your life are astrologically predestined, you always have free will to mitigate the impact of the event, or to transcend it entirely. 3. As you obtain master of life awareness and develop conscious detachment, you will be far less affected by worldly events than in the past. LAW OF KARMA Everyone is created equal in the beginning. Each one is completely independent and solely responsible for his/her life and body by their thinking and acting in each life. Whatever energy is expended through thoughts, desires, and acts, a like energy is returned. LAW OF KARMIC BALANCE Energy expended in one incarnation could be so overwhelmingly bad or good that to have it all return in one incarnation would put one out of balance. Therefore, it is dispersed and returned to be worked off in more than one lifetime. LAW OF MANIFESTATION Ideas and experiences create beliefs which in turn, create your reality. Beliefs can be changed when you recognize those that are not working for you, and begin programming what will create success and harmony in your life. LAW OF REINCARNATION Until you have resolved your Karma and fulfilled your Dharma, which are the deeds you must do, you will continue to reincarnate into sequential lifetimes upon the earth. LAW OF RESISTANCE That which you resist you draw to you, and you will perpetuate its influence upon your life. LAW OF SELF-KNOWLEDGE When one is aware of oneself and has information about oneself and understands these two combinations, one will have complete control over one's behavior, making life pleasurable and joyous. LAW OF SIMILARITY Look-a-likes are alike. Like produces like and an effect resembles its cause. Perhaps you are feeling “stuck” trying to manifest what you want in your life. Perhaps you feel as though you have done everything that the new age wisdom of manifesting suggests, such as affirmations, positive thoughts, creative visualization, and even hard work but yet you are frustrated with the results. These are all the conscious ways to create your dreams. However, the subconscious needs to be working in partnership with the conscious mind. In order for it to do that, we must bring the unconscious to the conscious mind to form that agreement that will power your dreams into reality. A shamanic practitioner can assist in removing imprints in the energy body that may be blocking you from manifesting your dreams. A hypnotherapist can guide you on journeys to the unconscious where blocks are identified and transformed. A human’s core beliefs are multi-dimensional. Similar to an onion, you peel away a layer at a time, until the core is fully discoverd. Laws of the Universe collected from various sources on internet and in books except Law of Reciprocity, which is mine. Copyright © 2013 Drake Bear Stephen. Except as Acknowledged. All Rights Reserved. 1. Various causes and origins of gender identity and sexual orientation. 2. 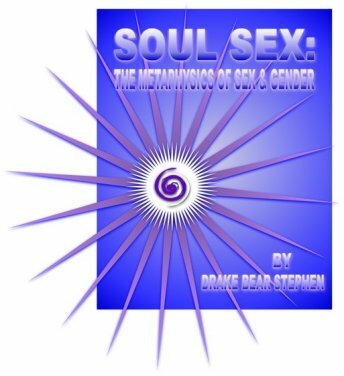 The metaphysics of sexual orientation and gender identity with a specific focus on reincarnation and past lives. 3. Autobiographical bits about myself. I am currently doing research for my book. 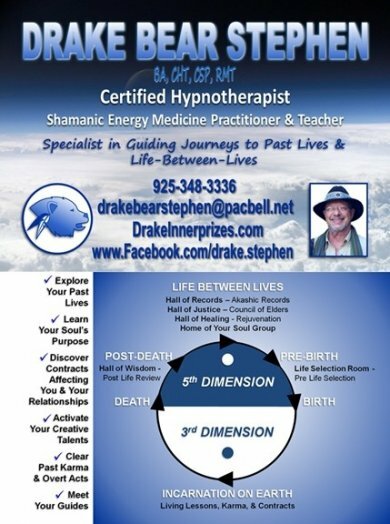 If you identify as gender fluid, transgender, transsexual, or gay and would like to have a free past life regression session, please contact me. The only qualifier is that one of the reasons for your regression quest must be related to why you came into this life as transgender or gay. Everything that happens in a session will be held completely confidential. If I use details from your session in my book, your identity will be changed so that no one will recognize who you are. Flesh and Spirit Community is hosting their annual retreat at Saratoga Springs on May 10-12, 2013. Intentional touch, breath, yoga, shamanic rituals, and ecstatic massage are some of the venues that will be used to awaken our sacred bodies. Both personally and tribally our connection to the earth, our ancestors and Spirit, will be remembered and felt through our bodies. I will be one of four facilitators for this event. Sorry all my female friends, this event is for men only. Additional information is available at: www.fleshandspirit.org/sacred-body.html. A new class will be forming soon so if you are interested in taking this powerful transformation class, please send me reserve a spot now. Additional information is available at www.drakeinnerprizes.com/training.htm. Reiki classes for levels 1, 2, and 3 will also be forming soon so if you are interested in taking this powerful form of energy healing, please reserve a spot now. Additional information is available at: www.drakeinnerprizes.com/training.htm.